Growing industrialization has led to an upsurge in demand for quick methods of cleaning household. Busy lifestyles has led the customers to opt for faster methods of cleaning the household. As some of the houses have more than one stories, traditional methods of cleaning in lesser time becomes comparatively tough. Dirty floor and houses can significantly impact health of the customers globally. Adoption of the vacuum cleaners enables the end users to save time for the customers who have busy timetable. Bound to these factors, adoption of the vacuum cleaners will continue to increase among the customers with busy schedule. 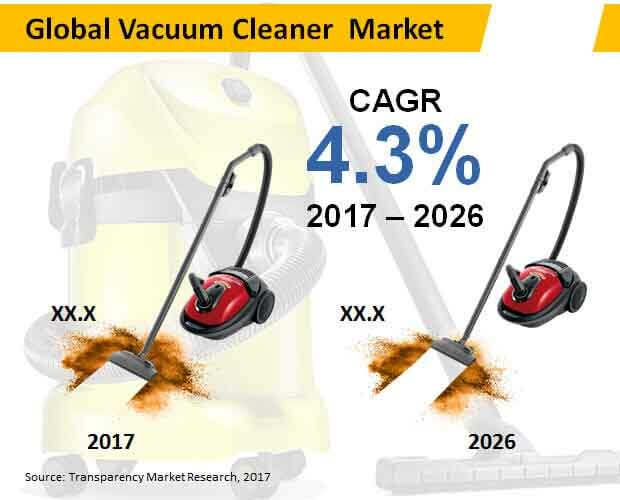 According to Transparency Market Research, the global vacuum cleaners market is expected to represent a value of over US$ 29,000 Mn by the end of 2026. While there are various alternatives for cleaning the house and floors, customers prefer adopting the vacuum cleaners. As the chemical ingredients used for cleaning purposes are proving to be hazardous for the health of the infants, pets and toddler, customers are increasingly adopting the vacuum cleaners for cleaning the floors. Moreover, use of the chemical ingredients further continue to emit carcinogenic particles in the air. These chemicals continue to remain harmful to the health of the customers globally. Further, various government organizations such as the EU Commission and FDA have imposed regulations against the use of chemical ingredients for cleaning the floor of the households. As customers are becoming increasingly aware about the harmful impact of the chemical ingredients, sales of vacuum cleaners is likely to rev up during the forecast period. The robotic vacuum cleaners continue to witness increasing demand among the customers attributed to various advanced features. The vacuum cleaners are equipped with the sensors that smartly track the sequential path in order to avoid obstacles while cleaning the floor. Moreover, the robotic vacuum cleaners operate on the power supply when the battery charge runs out. Robotic vacuum cleaners that are integrated with advanced technology offer the most convenient cleaning experience to the customers. Bound to these factors, demand for the robotic vacuum cleaners continue to increase in the global market. However, various factors are expected to inhibit growth of the global vacuum cleaners market during the forecast period. Stringent regulations imposed by the government organizations is expected to inhibit growth of the global vacuum cleaners market. For example, the European Union is increasingly focusing on reducing the consumption of the household electricity as well as CO2 emission every year while planning the ecodesign and labelling requirements of the vacuum cleaners. In order to implement the new energy label rule for vacuum cleaners, the European Union is planning to impose regulations against those vacuum cleaners that are more powerful than 900 W. These factors will continue to inhibit growth of the global vacuum cleaners market during the forecast period. With the growing need for cleaning the carpets and floor quickly, demand for the canister vacuum cleaners are expected to increase. On the basis of product type, the canister segment is expected to generate significant revenues, recording a value of over US$ 2,000 Mn by the end of 2026. However, the autonomous/robot product type segment is expected to witness a robust CAGR throughout the forecast period. Based on end use, the household segment is expected witness the highest revenue growth, accounting for a value of over US$ 4,000 Mn by the end of 2017. On the other hand, the independent retail store segment is expected to witness the fastest growth in the global vacuum cleaner market during the forecast period. Leading market players in the global vacuum cleaners market include Haier Group Corp., AB Electrolux, Samsung Electronics Co., Ltd., LG Electroncis, Inc., Dyson Ltd., Samsung Electronics Co., Ltd., iRobot Corporation, Bissell Inc., Koninklijke Philips, N.V., Panasonic Corporation and Techtronic Industries. Vacuum cleaners have remained ubiquitous in households around the globe. Vacuum cleaners have witnessed steady innovation, and many modern variants are capable of picking up even the tiniest of impurities, such as dirt and particulate matter. Although demand has remained steady over the years, a number of factors continue to influence the global market. This report offers a holistic perspective on the global vacuum cleaner market, offering insights, analysis, and valuable guidance on the prospects of global vacuum cleaner market. The market is analyzed for the period 2017-2026, and historical statistics are offered for 2012-2017. The report begins with an executive summary, which highlights the key points of the report. The executive summary is followed by an introduction and definition that offer readers information on the scope of the report. Key market dynamics, including comprehensive information on the drivers, restraints, opportunities, and trends that are shaping the market are also discussed in detail in the report. In a bid to give readers seamless and detailed information, the vacuum cleaner market has been segmented on the basis of product type, end use, filter, sales channel, and region. On the basis of product type, the report offers market forecast and analysis on the following product types – handheld, canister, upright, stick, and autonomous/robotic. The end-users of vacuum cleaners have been broadly segmented into residential and commercial. An analysis on these two dominant end-use segments has been carried out and detailed year-over-year forecast and analysis is offered to readers. By filter type, the key segments include ‘with bag’ and baglesss. By sales channel, the key segments include independent retail stores, chained retail stores, modern trade, company online, and third-party online. Sales of vacuum cleaners through these channels are discussed in detail, along with a country-wise analysis. The report offers region-wise analysis of all the segments discussed above. The key regions analyzed in the market include North America, Latin America, Europe, Japan, APEJ, and MEA. The performance of all these segments in key regions has been analyzed in detail, and the most lucrative and sluggish markets are discussed in detail. The report also profiles the key players in the global vacuum cleaner market, highlighting their key developments. The competitive landscape is an important part of the report that offers readers valuable insights and guidance on some of the key players in this market. Some of the key players profiled in the report include AB Electrolux, Haier Group Corp., LG Electronics, Inc., Samsung Electronics Co., Ltd., Dyson Ltd., Bissell Inc., iRobot Corporation, Panasonic Corporation, Koninklijke Philips N.V., and Techtronic Industries. Overall, the report offers a holistic assessment of the key factors that are likely to influence the market during the period 2017-2026. Readers can get comprehensive insights that can help them in understanding the likely performance of the market during the assessment period. The market estimates have been arrived at after thorough primary and secondary research. Political, social, economic, factors have been taken into account while compiling the report.